If Michael Vick would have read the book “A Three-Legged Dog Called Present” when he was a teen, maybe he would have learned to appreciate the unconditional love of dogs, and to prevent their abuse and mistreatment. Tripawds members know more than anyone about the wonderful gifts three legged dogs have to share. Present was no exception, and he his name said it all. 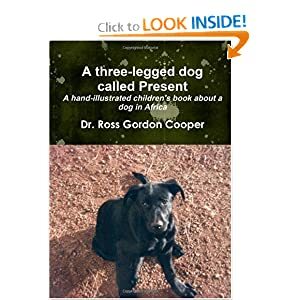 A Three-Legged Dog Called Present is a book for children at a teen reading level that details the amazing life of an African dog. Present was born in 1975 in a picturesque part of Rhodesia on a farm in the Eastern Border Districts. His rear right leg was injured and his life was saved by a vet who wanted to give Present as a gift to his son for Christmas. This hand-illustrated story, suitable for teenage readers, describes Present’s life in Chipinga and later in Harare, Zimbabwe. Dr. Cooper shares a comprehensive account of Present’s behavior, play, interaction, truants and senior years. Glimpses of the incredibly rich flora and fauna of Zimbabwe are narrated throughout. If a dog is taken care of it will reward its owner with true companionship, dedication and loyalty for life. The book A Three-Legged Dog Called Present also proves how extremely adaptable dogs are. Despite Present’s weaker leg, he did not let it interfere with his daily activities and he could run like the wind. See all books by Dr. Ross Gordon Cooper. 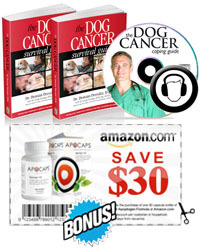 Start all your Amazon searches here to help support the Tripawds community!